First Parish Burying Ground, Newbury Mass. A collection of most recent projects.. Earlier this year, I proposed to the Newbury selectmen that they should consider adopting a program to help veterans who own property in town. Now, I have a question for the residents of Newbury: Would you be in favor of the town of Newbury adopting M.G.L. Chapter 59 Section 5N — “Reduction of property tax obligation of veteran in exchange for volunteer services”? By adopting this Mass. General Law, Newbury can establish a program to allow veterans, or a spouse of a veteran in the case where the veteran is deceased or has a service-connected disability, to volunteer to provide services to the town. Now, in exchange for their volunteer services, the town will reduce the property tax obligations of the veteran. This reduction will be in addition to any exemption or abatement of which otherwise they are entitled to. The veteran (or spouse) cannot be credited more than the current minimum wage of the state’s minimum wage per hour rate. The reduction of the property tax bill may not exceed $1,000 in a given tax year. The town would have the power to create local rules and procedures for implementing this program in a way that is consistent with the intent of this program if they choose to adopt this program. It is important to note that adopting this program cannot cause a reduction of workforce or replace existing staff and or positions. The amount of money reduced of the veteran’s property tax is not considered income, wages or employment. While they volunteer for the town, the veteran will be considered a public employee for the purposes of Chapter 258 and their services will be considered employment for the purposes of unemployment insurance as provided in Chapter 151A. The selectmen by vote may change the exemption in this program by: (i) allowing a representative for the veterans who are physically unable to provide services to the town; or (ii) allowing the maximum reduction of the property tax bill be based on 125 volunteer hours in a tax year, rather than the $1,000 maximum reduction. Would you be in favor of Newbury adopting this program? We already have one similar to this for senior citizens in town and some of our surrounding communities have already adopted it. On Tuesday, Oct. 24, at Newbury’s Special Town Meeting, there will be a vote on whether the town should adopt this or not. I personally think the town should; it would be a great way for the town to show their appreciation and support for veterans. Thank you all for your consideration on adopting this program in the town of Newbury. This is a small gesture to our veterans in town. 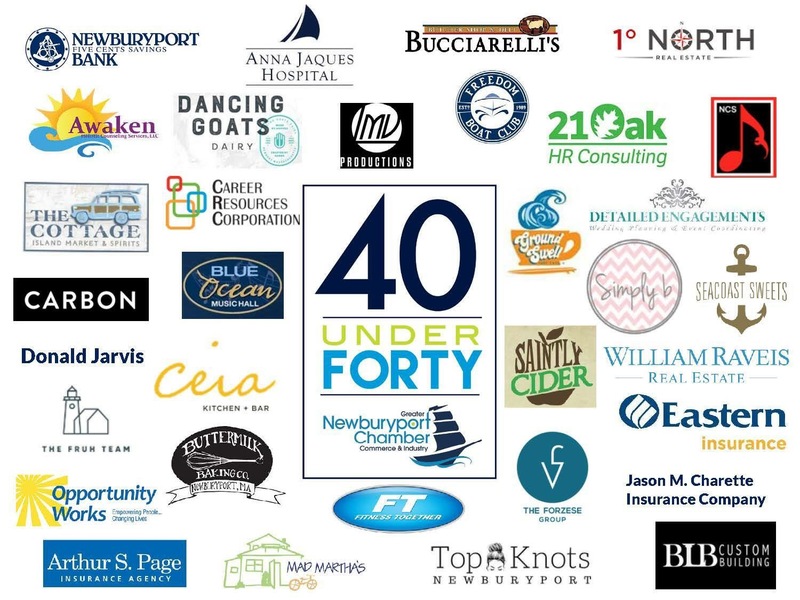 Donald Jarvis was nominated and selected for Newburyport’s Chamber of Commerce 40 Under 40 for 2017. The Town of Newbury is going into their three year of hosting the Wreaths Across America program. Wreath Across America started, ‘National Wreaths Across America Day’, with a goal of to covering all Veterans grave markers nation-wide with a Christmas wreath. Last year about half of the Veteran grave markers in town received a wreath. That’s more then double the amount of wreaths the program has their first year in Newbury. Creativity and out-of-box thinking proves to be the root of the programs success in Newbury. Linking of with local community groups, and businesses the program has grown year by year. This year our goal is to provide a wreath for every Veteran grave marker in Newbury (requiring roughly 600 wreaths). Details about this years ceremony are still being planned out. Keep checking Newbury Wreaths as information is constantly being added. On Saturday, August 19 2017 the Shirley Fire Department hosted their annual Bike Run. This year proceeds from the bike run benefited Operation Delta Dog. Mocha joined Chelsea Fire Department in promoting their bike run. On August 1, 2017 Yankee Homecoming hosted their annual Veteran’s Luncheon. This event was started by Frank Ventura, a Korean War veteran and long time Newburyport resident. It was sponsored by his son Dan Ventura at Fairway Mortgage of Newburyport. It’s been an honor to carry on this great tradition started by Frank. This year, over 120 veterans and their guests enjoyed a delicious meal at the Veteran Luncheon. The meal consisted of Pulled Pork sandwiches and coleslaw from Rusty Can in Byfield, MA. The salad and vegetables were donated by Vets & Veggies in Athol, MA. The coffee was donated by Battle Grounds Coffee Company in Haverhill, MA and Cares O-lot Confections provided a delicious American Flag cake along with other assorted desserts. Family and friends also donated desserts and other items. 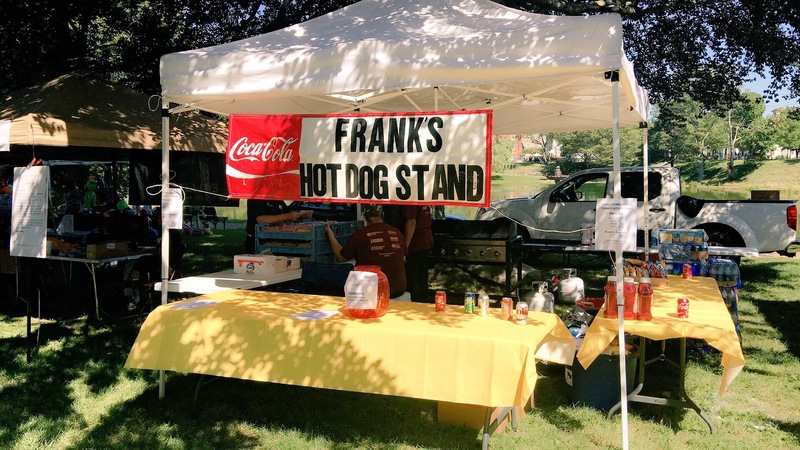 2017 marks the second year of me running, and organizing “Frank’s Hot Dog Stand” as part of Newburyport’s Yankee Homecoming. 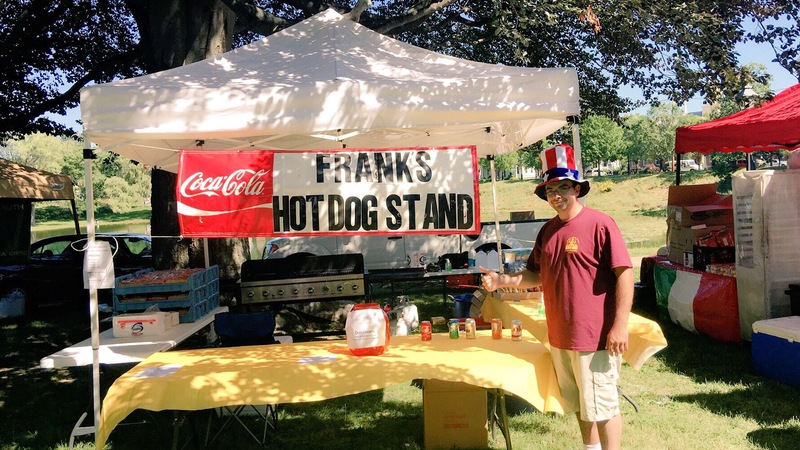 Frank’s Hot Dog Stand was originally ran by Newburyport native Frank Ventura who passed away in July 2016. Frank Ventura ran this Hot Dog Stand for several years for Yankee Homecoming. Formally this was referred to as ‘Yankee Homecoming’s Food Booth’, however, given Mr. Ventura’s dedication to the City of Newburyort and Yankee Homecoming we decided to rename the booth in his honor. Today, over 500+ Hot Dogs were sold at Frank’s Hot Dog Stand with all proceeds benefiting Yankee Homecoming. The Hot Dog Stand is back of Yankee Homecoming’s Olde Fashion Sunday which is the official kick off day of Yankee Homecoming! Looking forward to many years of organizing and running this booth. It is truly an honor and privilege to carry on Frank’s tradition. For the last couple of years Yankee Homecoming has hosted an annual Free Veteran Luncheon. This year the veteran luncheon is being held at the Firefighters Memorial Hall in Newbury. In the years past this event was held at the Elks Club in Newburyport. 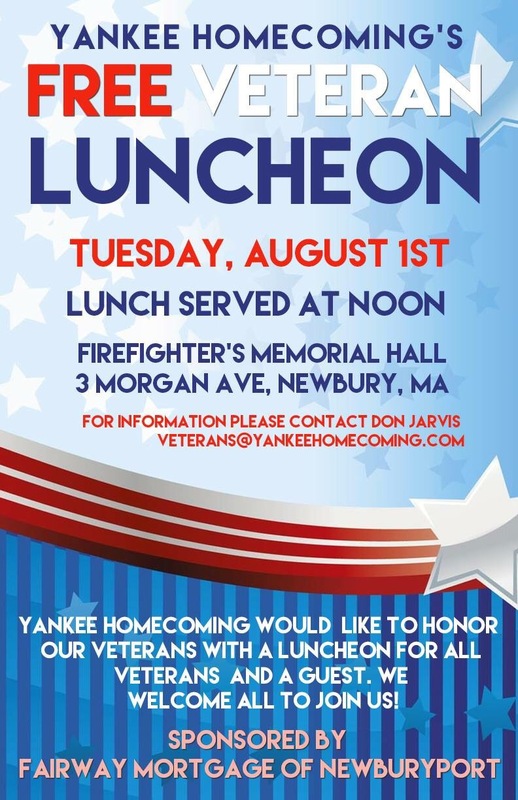 As a resident of Newbury and a veteran that is extremely active I’ve been working tirelessly the last couple of years to increase veteran related activities in town – relocating this luncheon is a step in that direction. In addition to serving a nice hot lunch to veterans; this luncheon also supports other veteran related projects. The vegetables at the luncheon will be from Vets & Veggies, a new nonprofit located in Athol, Mass. Vets and Veggies is an organization that provides housing opportunity for veterans and promotes a safe community environment. They work with veterans to establish education goals and job skills. Keeping the veterans hands and mind busy and building their self‐esteem all while growing food for the community. While in this program veterans will have the opportunity to integrate into the local and surrounding community, while learning how to organize and set up a long term sustainable income. Veterans love their coffee and I would be crazy not to have coffee at the luncheon for our veterans. In Haverhill there is a brand new coffee shop called “Battle Grounds Coffee Company”. Battle Grounds Coffee Company is an veteran owned and operated business. Battle Grounds is owned by a former Navy Seal Salvatore Defranco and his wife Dana Defranco. Most of the employees are veterans as well. As a veteran myself, served 7 years in the Massachusetts National Guard as a Combat Engineer with deployments to Iraq and Afghanistan. It’s a real honor to organize this luncheon for the second year in a row. Over the past could of year I’ve been working on doing more and more things to honor and support veterans in my Town of Newbury. This event is another great step in that direction. Any veteran looking to attend or would like to reserve a spot for them and a guest they can email me at veterans@yankeehomecoming.com – this luncheon is open to all veterans. Tonight I went before the Newbury Board of Selectmen to ask them to consider adopting Mass General Law – Chapter 59 Section 5N ‘Reduction of Property Tax Obligation of Veteran in Exchange for Volunteer Services’. For the town to adopt this section it will need to go before Town Meeting for vote. I did ask the Board of Selectmen to consider moving forward and encouraged them to form a ‘work group’ with various stakeholders including myself. As Memorial Day approaches things are happening around the Town of Newbury. Flags for the veterans’ graves have been ordered, walks around the ceremonies have been and are being conducted, and for the first time ever – veterans graves are being cleaned and reset (if needed). A newly formed group, Preserving Newbury, which consist of the volunteers who spearheaded the much need major clean up project at the First Parish Burying Ground. Since handing over the day-to-day upkeep and maintenance work back to the First Parish Church – these volunteers still wanted to continue doing preservation work, and work preserving the past, the future and the history of Town of Newbury. In a medical emergency situation veterans may find themselves being stuck with medical bills for services and treatment received at a non-VA Emergency Rooms / Hospitals. Not every VA Hospital has an Emergency Room. There are some guidelines outlined by the VA and a process that can be done to appeal the VA decision care the bill, however, it’s not guaranteed, and the entire bill may not be cover. Engaging Students in South Byfield Cemetery.